SimmerMat - "it really works!" Amazon, America's largest online retailer, features the SimmerMat in their Kitchen and Dining section, for sale through our US distributor IMCG. "This has already saved several pot's from being scorched or burned. Don't know how I cooked without it!" "I was extremely pleased to find that this product really works. My pots don't boil over any more when I'm simmering rice or soup. It's a very simple principle and a very good design, superior to most of its competition." Excellent for making tomatoe sauce!! 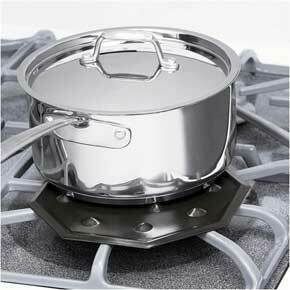 "No need to babysit your sauces with this simmer mat. Just bring up to a boil put on the simmer mat turn the heat down low, & your good to go!! LOVE IT!" "I ordered this as a gift. It arrived quickly and was just as I expected." "Even at its lowest setting, the so-called simmer ring on my gas stove would always bring my meat sauce or pot roast to a slow boil. With the Simmer Mat, I have so much more control. I only wish I had known about it a long time ago!"